The marsh periwinkle, Littorina irrorata. Salt marshes are among the most ecologically and economically important habitats along the east coast of the U.S. and are increasingly exposed to intense and pervasive human disturbance (e.g. eutrophication, invasive species). Predicting how marshes respond to such perturbations is key to their survival. Our limited basic knowledge of how salt marshes are organized, however, has made the goal of preserving and restoring them difficult. My research addresses several key questions in marsh ecology that are critical to understand for successful conservation of these important coastline communities: (1) How will over-fishing of marine predators cascade downward to effect marsh structure and function? (2) How do top-down and bottom-up forces interact to drive of die-off of southern salt marshes? (1) Why are some salt marshes susceptible to invasion and subsequent ecosystem degradation by the common reed Phragmites australis? Results from my work in east coast marshes have challenged the long entrenched, bottom-up paradigm of salt marsh ecology. 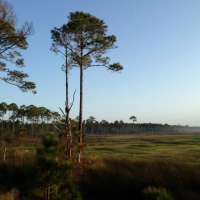 Specifically, my research has revealed that southeastern marshes are the product of a simple trophic cascade, where marine predators, such as the commercially harvested blue crab, facilitate marsh plant persistence and productivity by controlling densities of plant-grazing snails. 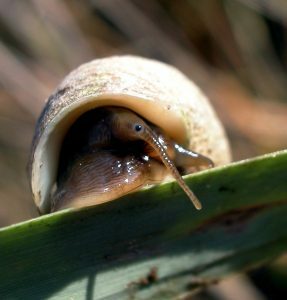 When released from top-down control, snail numbers increase and grazing by high densities of snails (whose radular activity facilitates invasion of growth-suppressing fungi) converts lush intertidal grasslands to mudflats. These findings have major conservation implications, as they potentially link the health and function of southeast marshes to the management of crab fisheries. Within the last 4 years, blue crab densities have declined precipitously (40-80%) in southeast estuaries. Concomitant with this crab decline has been unprecedented marsh die-back. I have surveyed many die-off areas and found 300m long fronts of snails (2000 ind./ m2) mowing down marsh grass at up to 100m2/ month. Given these findings, it is possible that the cascading consumer effects shown in my small-scale experiments may already be at work in southern marshes. Based on the urgent implications of these results, I plan to examine: (1) whether decline in blue crab populations indirectly contributes to southern marsh die-off by releasing populations of plant-grazing snails from top-down control, and (2) the extent to which bottom-up factors, such as nitrogen eutrophication and high soil salinities (chronic problems in many marsh ecosystems around the world), exacerbate top-down effects and stimulate snails to graze down marsh grass. To address these goals, I will use small-scale experiments coupled with large-scale, correlative approaches. 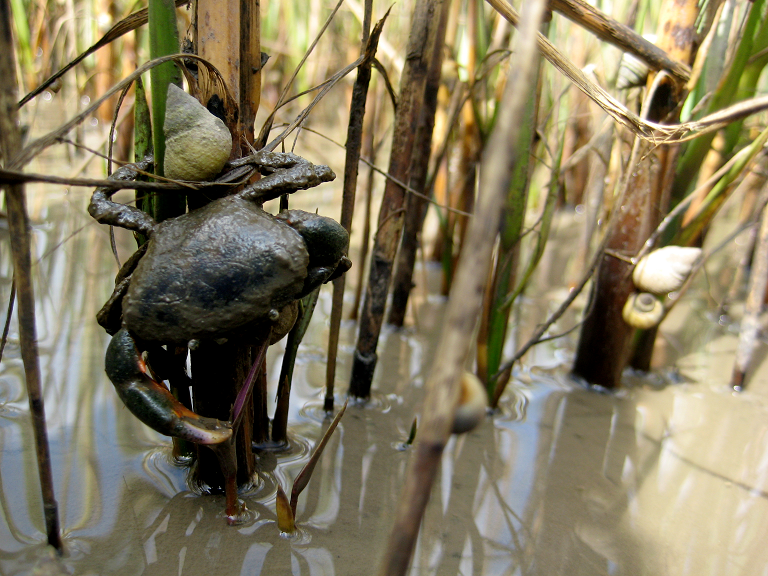 By manipulating crab, snail, nutrient and salt levels, the direct mechanisms driving marsh die-off will be elucidated. By employing long-term (~30 yrs) data sets of blue crab harvests, snail densities, and incidence of scarring on archived snail-shells (data sets have been collected from over 40 sites in 6 different states), I will scale-up results to both landscape and long-term levels. Results from these studies will likely challenge coastal managers and marine ecologists to re-evaluate their understanding of controls on salt marshes and other marine plant communities and incorporate top-down effects into their management and conservation plans. In New England salt marshes, my experimental studies have shown that top-down forces decrease in importance (due to turnover of grazer species) and that coastal eutrophication (an exaggerated bottom-up effect), precipitated by local shoreline development, is driving major shifts in salt marsh plant assemblages. This human-induced nitrogen loading has transformed once diverse shoreline plant communities into mono-specific stands of an invasive clonal-dominant (Phragmites australis). Phragmites invasion in southeastern marshes, by comparison, has been much less extensive. In future research, I plan to examine experimentally mechanisms underlying delayed invasion in southern marshes (e.g., higher salinities, competition for light from more robust plant species, less shoreline development). Identifying these factors will be critical for conservation efforts needed to prevent repeat of the near meltdown of ecosystem structure and function in northeastern salt marshes. Because human activities, such as the shoreline development, severely threaten marsh structure and function over the entire continental coastline, but relatively little attention was being paid to those threats, I am spearheading an effort as lead editor to assemble a contributory book (through University of California Press) that will synthesize and highlight human impacts on North American marshes. The book is designed to: (1) help coastal managers identify and ameliorate anthropogenic threats to salt marshes and (2) provide a model for identifying the causes and consequences of human activities to the structure and function of shoreline communities. In addition, I am currently working with the Nature Conservancy through the Efroymson Fellowship program to devise a multi-site, multi-scale conservation plan for East Coast marshes, which will incorporate findings and recommendations from my research on human modification (i.e., invasive species, eutrophication, cascading consumer effects) of New England and southeast marshes.